I love trying out new recipes for fish. And most of the time, that fish just happens to be cod. It's our favorite. And when I say our, I mean my son and I. My husband just won't touch it! Well, I guess I should say that he won't touch the kind I make. He only likes it fried. Why? Because then you don't taste fish, of course! I used to only make it for my son and I when my husband would work nights, but his job changed and now he's home every night for dinner. Will that stop me? Heck no. Will I make it fried? Probably not! I'm still going to experiment with new recipes and hope he'll come around because my son and I just love cod. My son has, in fact, loved every single fish recipe I've made and I just couldn't be happier! This one was my latest and the sauce had a great shallot flavor. 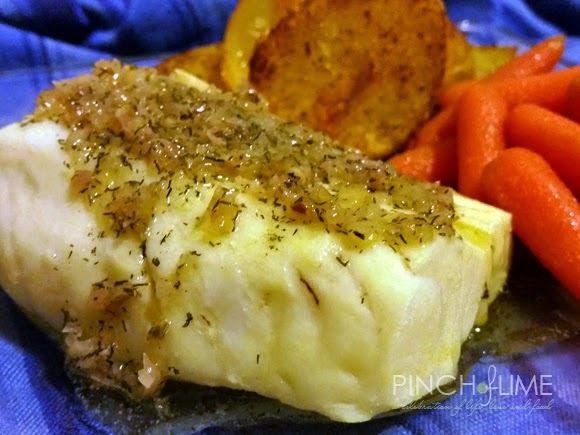 The fish is mild enough to let the sauce shine, but full of flavor from the poaching liquid. Oh, and if you're like me and don't feel like running to the store every time you want fish for dinner, buy it frozen from Costco. I never used to buy frozen because it would always taste too fishy, but the Kirkland brand is awesome and tastes great. 1. In high-sided skillet, add chicken broth, lemon juice, wine, and salt. Bring to a simmer over medium heat. 2. 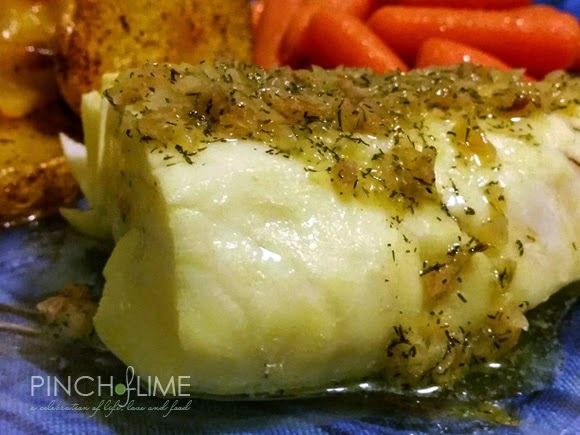 Add cod to skillet, cover, and cook about 7-10 minutes (depending on thickness of fish). Turn over once during cooking. 3. Meanwhile, heat butter and shallot over medium heat. Once shallots are starting to soften, increase heat to med-high and cook until butter is starting to brown slightly. Turn off heat and stir in lemon juice, dill, and salt and pepper. 4. Plate fish and drizzle over sauce.